And so the Responsible Wood offices were abuzz with activity as the Standards Development and Accreditation Committee (SDAC) appointed an independent auditor to oversee Responsible Wood’s ‘check compliance’ to Standard Development Organisation (SDO) requirements. According to Alan Snow, Responsible Wood’s certification coordinator, the surveillance audit provides Responsible Wood with an opportunity to demonstrate to Standards Australia the organisations ongoing commitment to standards development. “With the rebrand from the Australian Forestry Standard to Responsible Wood, we are the only forest certification scheme that has the endorsement of Standards Australia for sustainable forest management and chain of custody for forest products,” Mr Snow said. 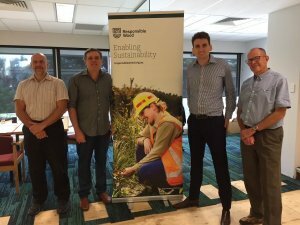 According to Jason Ross, the Responsible Wood certification scheme’s unique position as an accredited SDO provides consumers of timber and timber-based products with the trust that timber has been sourced from a sustainable source. “We are the ultimate ‘trust mark,’ with the endorsement of Standards Australia consumers can take heart that products that carry our logo are not only better for the forests but also better for you and me,” Mr Ross said. But it is the overarching governance structure, the commitment to independence in the certification process is of utmost importance. “If consumers are looking for a credible forest certification scheme, the Responsible Wood certification scheme ticks all the boxes,” Mr Dorries said. For more information about standard development, including a detailed overview of our standards, please refer to the Responsible Wood ‘Standards Brochure’ which is available through the Responsible Wood website.